If you’re lookng for the most authentic yet luxurious accommodations and hospitality in Bhutan, then Zhiwa Ling offers just that. Fiver years in the making, it’s the first Bhutanese designed and owned hotel in a class of its own, making a real tribute to the masterful work of over 60 talented artisans. And amazingly, it’s all handmade. Yep, all of it, from the elaborate stonework to the intricate woodwork. The result is definitely worth seeing. Just a five minute drive from Tiger’s Nest (and with a view of it from your bedroom window), Zhiwa Ling is located in the heart of Paro Valley – the gateway to all the trail heads and hikes you’re wishing to master. The rooms at Zhiwa Ling are more than spacious, and exude a rustic and seriously romantic feel. 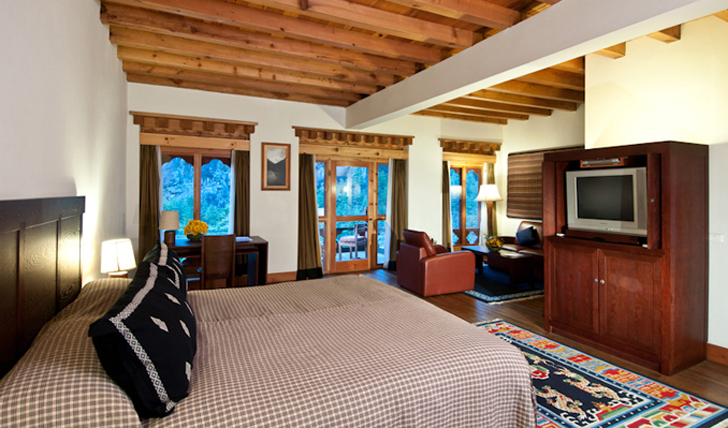 Many have balconies, and each come with that must-have jaw dropping views of Paro Valley. With your own personal scenic viewpoint, under-floor heating beneath your feet, and all the modern amenities you need, your room is pretty much the ideal haven of luxury you could ever ask for. With an in-house temple, spa, tea room, meditation house, Mad Monk Bar and Namey Samey Nightclub (yes really), Zhiwa Ling has it all. 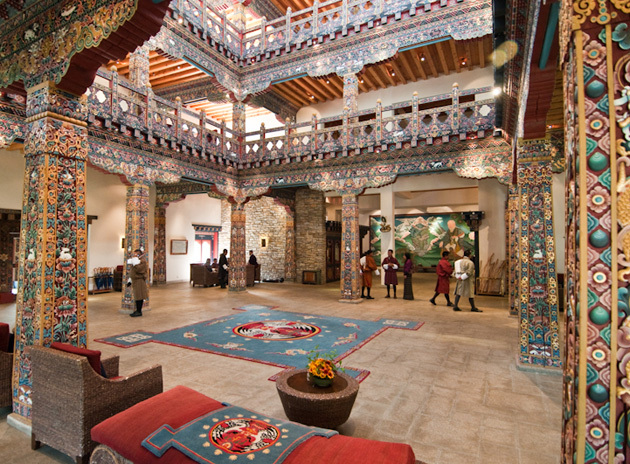 We love how the entire hotel is designed to contribute to the local community, and it gets that blend of traditional Bhutanese style with modern (and luxurious) amenities just right. The ema datsi is great too – that’s the traditional dish of chillies and cheese.